Lightly spray your temp-tations® loaf pan with non-stick cooking spray. Set aside. For the cake, place butter, cream cheese and sugar in the bowl of a stand mixer. Beat on high for 3 minutes, scraping the bowl as needed. Add in orange zest, eggs and vanilla. Blend until smooth. Slowly blend in flour and baking powder. Fold in cranberries and pour batter into your loaf pan. Bake for 45 - 50 minutes or until a toothpick inserted into the center comes out clean. Set aside to cool. For the glaze, whisk together all of the ingredients in a small bowl. Add more orange juice if needed. Remove cooled cake from pan and set on a wire rack with a piece of parchment paper underneath to catch the drippings. Pour glaze all over the top. 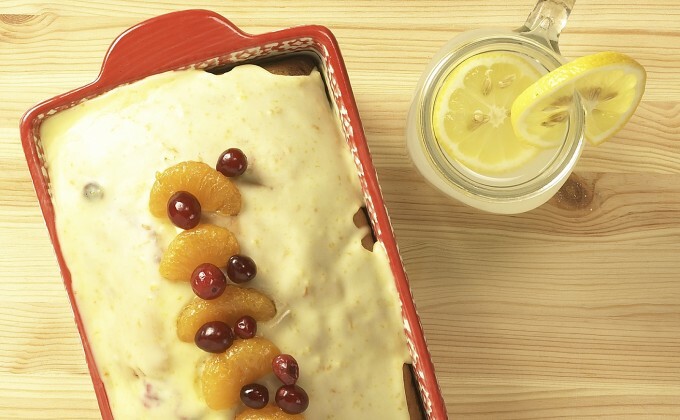 Top with fresh mandarin orange slices and cranberries, if desired. Slice and serve.